On April 10, 179 towns and organizations from 17 states publicly launched the National Campaign in Defense of Mother Earth and Territory. Today, that figure has grown to 215 registered communities and towns in total, including 43 academics, musicians, theatrical and religious actors–all together making up the Committee for Mother Earth. So-called “progress and development” are permanent threats to the people and their natural assets. There are 97 conflicts which our communities face: Power Generation Projects 34%; Mines and mining project 32%; Privatization of water 15%; Transport infrastructure 12%; Construction 11%; Water extraction 7%; tourist developments 7%; Environmental pollution 6%; Logging 4%; Lack of land regularization 4%; Water management 4%; and GMO Soy 1%. 1-In San Salvador, Atenco: against the New Airport of Mexico City project, specifically the construction of the highway “Pirámides-Texcoco” in Tocuila. 2-The Papagayo river, in Guerrero: against gravel extraction and the possible reactivation of arrest warrants against spokesmen Council of Ejidos [communal land] and Communities Opposed to La Parota Dam. 3-In Tecámac and Coyotepec: threats to the integration of Autonomous Systems of Potable Water. 4-In neighborhoods of Santo Domingo and towns of Pueblos La Candelaria and Los Reyes, in Mexico City: defending the wellspring which is affected by real estate. 5-In the Otomí community of San Francisco Magú: fighting the real estate development in the Paradise Forests (Bosques del Paraíso). 6-In Xochicuautla: against the plunder, home demolition, destruction of infrastructure for the Naucalpan-Toluca highway. 7-In Amilcingo, Morelos: judicial harassment of Eleazar Zamora and Samir Flores, land defenders. 8-The San Pedro river: resisting attempts to construct the hydroelectric dam “Las Cruces” after an alleged consultation to the Náyeri people. 9-In the Maya de Chablekal, Yucatán community: a police sweep results in four people arrested and one family evicted. All these actions are systemic violations of human rights, with heavy impact on the social culture. Without land, there is no culture, there is no life! April 12– Declaration of Chipaneca towns and communities joined the campaign. April 13– Protest in support of Xochicuatla. Facing the violence and plunder of the State and the large capitalist companies, the Campaign for the Defense of Mother Earth and Territory begins a new phase of producing diffusion materials [propaganda], a result of intense work by investigators and professional artists who accompany them. We invite you to be on the look-out for these activities and the materials which we will soon publish. Communiqué of San Miguel Tocuila, read in a press conference that took place on May 25th, 2016 in the Museum of Mamut. The communiqué that we present here is meant to denounce the bad governments that continue dispossessing the people from their territories, continue making unjust laws to legalize the looting, destruction, and appropriation of the land and all of the resources it contains. The grand capitalists continue monopolizing the territories of our people creating misery and oppression. Across the entire country resistances are surging against the unjust grabbing of their natural resources and their territories, like in Xochicuautla and Cherán that defend their forests, Coyotepec that defend their right to water, Tajamar that hold back the destruction of their mangroves, and San Mateo Chipiltepec that defend their hill Tezontlalli, just to mention a few. The people that are on the edge of the ex-lake Texcoco have continued in resistance since 2001, when we raised our voice and our machetes opposing the megaproject of death and dispossession of our lands. This resistance has continued despite the events that took place 10 years ago when we were brutally repressed. Furthermore, we have been constantly harassed and intimidated by the government and businesses that purchase the wills of the people, destroying our social fabric because the government works with its dependents: the Agrarian Office, the National Agrarian Registry, CONAGUA, SEMARNAT, the courts, and in complicity with the ejidal commissions, they defend the interests of the oligarchy leaving the people immersed in hunger and misery. On April 23, our struggle continued against the company CYPSA VISE, when their workers began the construction of the highway PEÑON-ECATEPEC in the ejidos of San Miguel Tocuila and the neighborhoods of Santa Cruz de Abajo and San Felipede. These works were carried out in an illegal manner that violates the protection granted on April 12 of this year by the Ninth District Court of the State of Mexico: 349/ 2016-III. Because of this it was decided that we would install an encampment to block the entry of machines into the territory, organizing committees of surveillance day and night to safeguard the ejidos because the workers of CYPSA VISE had already advanced 1 km filling the ejidos with materials like rock, plastic, and geotextile. Thus, the ejido members and the community decided to flood the ejido with residual water and carry out reforestation in the zone, in order to stop the passage of the company CYPSA VISE. Once more is has became evident that the laws are only applied to the people who are organized while the companies remain unpunished because they work in complicity with the government while the people are repressed. Our struggle is not only for the land, but also for the water, our traditions, our culture, our identity, the environment, our history, and the future of our families. How is it possible that the government of Enrique Peña Nieto assumes that the construction of the new airport will be sustainable, when they have violated the international agreements that protect the habitat that is home to endemic and migratory birds? How is it possible that Enrique Peña Nieto wants to lower pollution levels, when with this project they will increase toxic emissions? How is it possible that the government talks of human rights, when in this country they disappear students, kill journalists, beat teachers, and take the right of a dignified life from us, incarcerate people that defend their land and let free rapists, narco-traffickers, and corrupt politicians? No government in any another country has scrapped its original airport plan only to carry out another and we are convinced that our demand is just and our struggle is necessary. We will not negotiate, not even 5 centimeters of our territory, because we are not willing to sell our dignity. The slogan is clear: the land is not for sale, it is loved and defended. We will not step down. We already know the methods of repression, intimidation and harassment. We cannot be surprised. We are convinced that the organized and united people will never be defeated, and this motto is more than a slogan but is part of our reality. For this we call on all social organizations and the people in general to join this struggle, to inform and to organize. Never more the dispossession of our people, never more the barbarism in our territories! 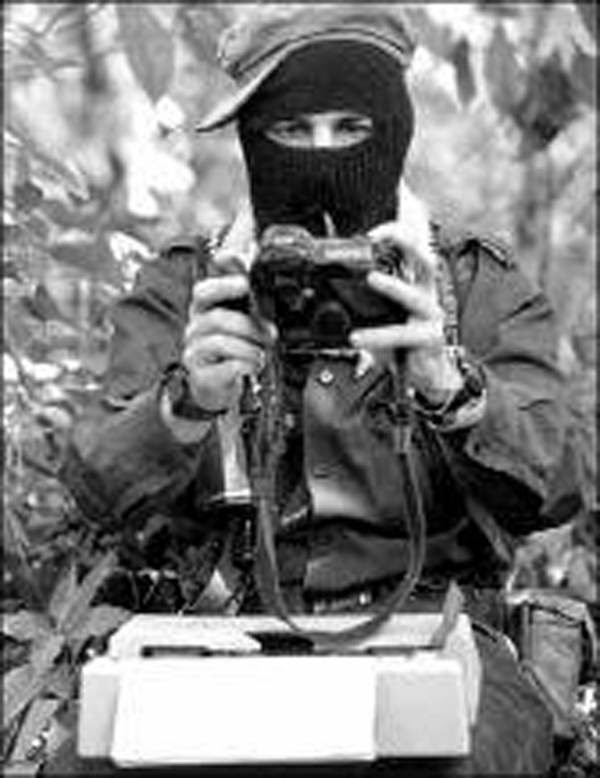 Atenco lives, the struggle continues! Toquila lives, the struggles continues! Parents hold assembly in Chiapas. Photo: Chiapas Paralelo. TUXTLA GUTIÉRREZ, Chiapas. – After nine days of the work stoppage, teachers of the National Coordinator of Education Workers (CNTE) and parents’ committees from at least 60 municipios of Chiapas formed alliances for continuing the teachers movement in the state. Representatives of at least 60 Chiapas municipalities arrived at the assembly of parents that was held in the installations of Section 7 of the National Education Workers Union (SNTE), with the attendance of at least one thousand personas. On the weekend the mothers and fathers held different marches in support of the teachers in diverse municipalities. In Huixtla, on the Chiapas Coast, they closed the doors to the Municipal Palace; in San Cristóbal and also in Comitán they initiated the collection of provisions to take to the encampment of teachers. In the capital of Chiapas they held a large mobilization today, and they have constantly been taking food to the ones that are in the occupation. On Friday, May 20, 2016, the Secretariat of Public Education (SEP) announced the firing of 3,119 teachers in Guerrero, Oaxaca and Michoacán that had 4 consecutive absences due to the strike. The next day, the SEP announced that 1,134 striking Chiapas teachers would be fired for having four or more absences due to the strike. Following the murder of indigenous leader Berta Caceres, the Civic Council of Popular and Indigenous Organizations of Honduras (COPINH) has convened a Global Action on 15th June 15 to demand justice through demonstrations in that country and in front of the embassies of Honduras around the world. The protests aim to demand the immediate establishment of an independent investigation group led by the Inter-American Commission on Human Rights (CIDH), to clarify the crime and ensure the prosecution of all those responsible. In addition, the demand is for the immediate and definitive cancellation of the concession granted to the company DESA for the construction of the hydroelectric project “Agua Zarca” on the Rio Blanco. Berta Caceres, coordinator of COPINH, was killed on 3rd March at her home in La Esperanza, when unknown individuals entered in the morning. The environmental leader fought for the cancellation of Agua Zarca project because it is a threat to the indigenous peoples and nature.